Web Solutions for Revenue Generation. We Fuel Your Revenue with the Best Technology and Reliable Vendors Having Right Talents to Make Your Business Competitive in the Digital Age. We help your business to build cost-effective digital assets and quantify the benefits of your technology solutions for revenue, decreasing cost/expense and improving employee productivity. Submit your business Request For Quotation (RFQ) or Request For Proposal (RFP) through IBC Digital BridgeTM platform and our Program Management Office (Canada) will do the rest to ensure cost effectiveness and worry free delivery of your project with involvement in bidding process of trusted vendors with proven track record from Canada, United States and Europe. 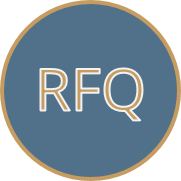 When You Need to Submit RFQ? You would submit to us a Request for Quotation (RFQ) when you know exactly what implementation, services and technology you need to keep your business performing in today's digital age, and the only thing you need is professional support. An RFQ is usually used for commodities, simple services or mainstream products with little room for product or service differentiation between responding vendors. You would submit an RFQ based on these specific requirements. Then our registered vendors would get notified about publishing your RFQ on IBC Digital BridgeTM platform and would start bidding. Eventually, together with owner of the RFQ we evaluate the bidders using specific criterion agreed upon. By clicking the button Submit RFQ below, you will be directed to the RFQ Submission Form, which will guide you regarding the information you have to provide and submit using the form. To access RFQ Submission Form you have to Log In or Create your business acoount on the website of IBC Digital Bridge platform first. When You Need to Submit RFP? You would submit to us a Request for Proposal (RFP) when you need a solution to solve your business problem using information technology, but aren’t married to any particular IT services and technology enabling revenue performance management. Submitting a request such as this would solicit different proposals, and it is called Request for Proposals (RFP). 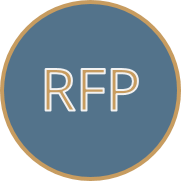 The RFP has the potential to give you a new implementation or solution you never thought of, that would dramatically save your time and money. However, you must be very specific in terms of business outputs the solution has to produce or enable. By clicking the button Submit RFP below, you will be directed to the RFP Submission Form, which will guide you regarding the information you have to provide and submit using the form. To access RFP Submission Form you have to Log In or Create your business acoount on the website of IBC Digital Bridge platform first. Don't Know How to Proceed? Before writing your RFP/RFQ, you can ask for help our digital business development experts to find out what kind of existing technology solutions would help most in the efforts of achieving your business goals and your competitiveness on market in the digital age. Our corporate partners and individual experts with over 15 years of experience, offer Digital Business Strategy Planning services to the business clients, who have desided to take advantage of web technologies and Internet of Things, to effectively engage with their target audience and achieve competitiveness in their target markets. We believe that digital business strategy planning is critically important component for success on the nowadays market, and we encourage your business to go through the planning before writing RFQ/RFP. 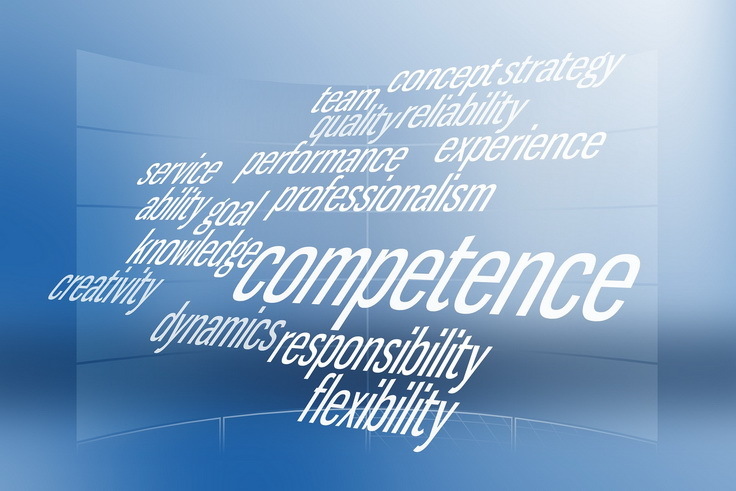 We help companies to anticipate and prepare for the future at all levels: corporate level, business unit level and team level. By clicking the button Request Help below, you will be directed to the Request of Help Form, which will guide you regarding the information you have to provide and submit using the form to our experts. To access Request of Help Form you have to Log In or Create your business acoount on the website of IBC Digital Bridge platform first. we are working together with you (the buyer) on identifying and mitigating the risks that may be triggered by the following Eight Business Challenges that keep every business owner or CEO up at night. We find the vendors with smart, positive, motivated professionals who share the vision you have for your business success. We help you to understand IT consumerization trends, and make sure that you are getting the most relevant technology and solutions. We understand that you want to save or/and to generate more revenue due to implementation of your request. We are on the same page. Any transformation is challenging, and digital one is no exception, since it requires expertise. You can count on our experts for sure. The technology solutions from our vendors will definitely help you to discover where your competition is and make you competitive. We want that every technology solution you implement with our vendors will delight your existing customers and generate new ones. Should you need a professional advise on how to meet all compliance requirements, our professionals will be happy to help. Our vendors help you to streamline your digital business processes and make your IT solution's interface user friendly to remove the fear of complexity. We offer customers proven approach to IT system simplification and risk mitigation in complex IT projects that was developed on the basis of worldwide best practices by our partners and is required to follow by the vendors registered with us, when they plan, develop, integrate and deploy IT business solutions as part of they efforts within implementation of your RFQ/RFP. The research results published in the whitepaper show how dramatically complexity of IT system depends on its functions and connections. 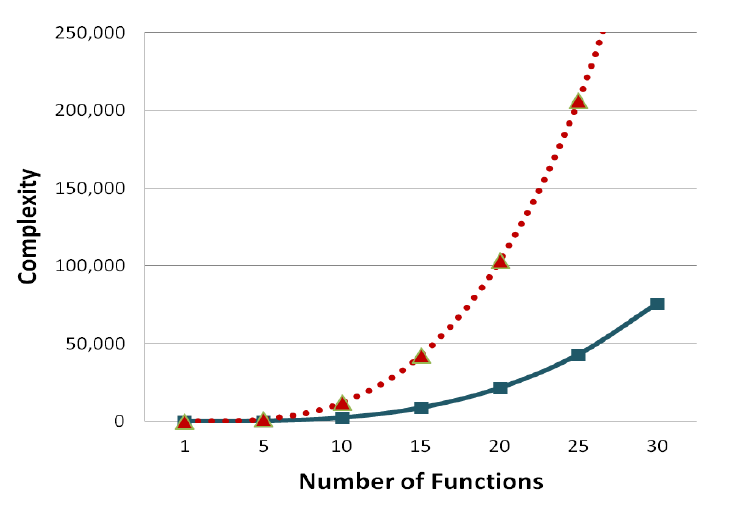 The red dotted line shows essential increase of complexity when the number of connections in the system is doubled at given number of functions. Particularly, for an IT system consisting of 25 functions and 25 connections, when the number of the connections doubles (i.e. 50 connections), the system complexity increases by 5 times. Why Working With Us Brings the Best Value? On request of the buyer we may overtake management of the RFQ/RFP related project until it is successfully delivered. Our confidence in right expertise and capabilities of the vendors registered with us is based on their actual achievements. Our ultimate goal is connecting our buyers to the expertise and the digital business solutions that make them competitive and better performing in the digital age, to increasingly generate more revenue for them. Chairman & President -- IBC Bridge Canada, Inc.
uccess of both, the buyer and the vendor, is equally important to us, since we all together are working as a united team to deliver every RFQ/RFP related project on promise, on time and on agreed budget. 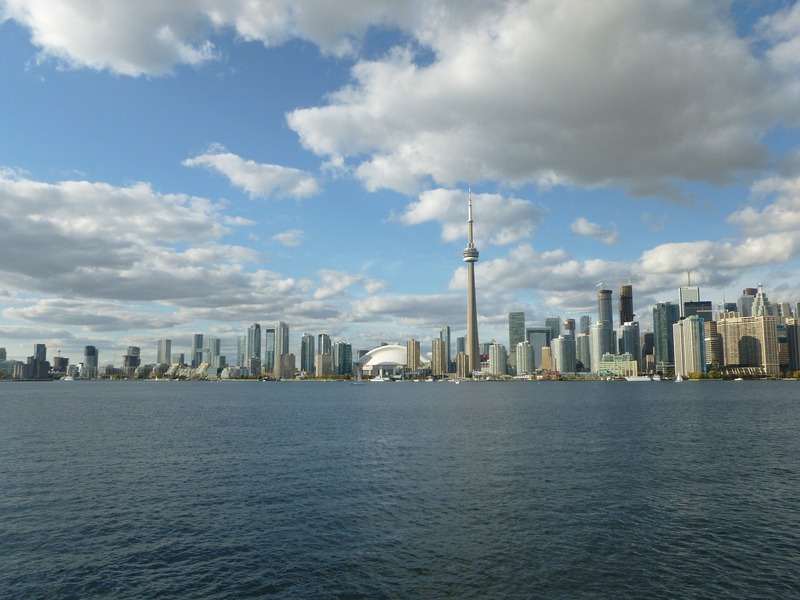 Out team here in Canada glues both sides - the buyer and the project vendor(s) to achieve the RFQ/RFP implementation success and the highest customer satisfaction. 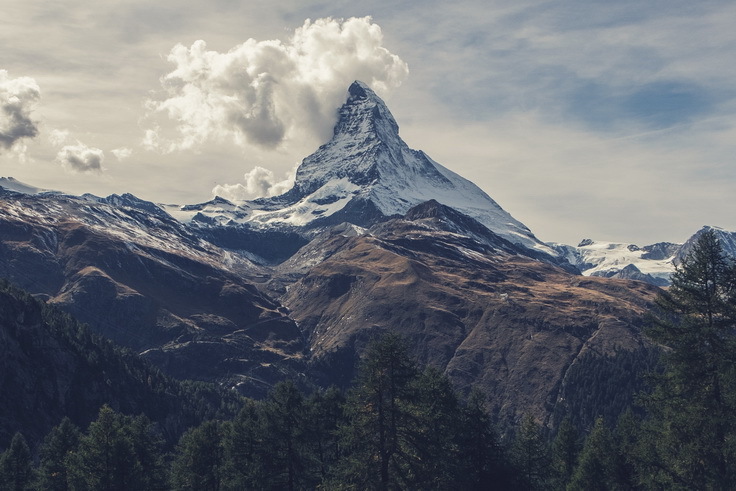 You don't wander blindly—hoping that you are acquiring the right expertise, technology and services from good vendors and at the best possible prices, you simply know what you will get as a result of your RFQ/RFP implementation. We established simple, but clear for our customers key performance indicators (KPIs) as part of IBC Bridge Canada's overall mission to set, track, and achieve best performance for and satisfaction of our customers. KPIs measure the most important activities and results associated with performance measurement of our team members and implementing vendors. We provide comprehensive assistance to the Buyer including the four phases mentioned below: from RFQ/RFP formulation, posting, promotion among vendors to their IT project successful completion. After the buyer having active account with us submits their RFQ/RFP, we notify the vendors that have active subscription for our services, about the bidding opportunity, and start collecting Quotations | Proposals from vendors. After the deadline for submission of specific RFQ/RFP has elapsed, in consultation with the buyer we short-list proposals from vendors and begin planning face-to-face video-conferences with representatives of the short-listed vendors to identify the most suitable vendor(s) for RFQ/RFP related project. Should the Buyer need additional financing sources for implementation of their RFQ/RFP, we assist them in preparation of application for the line of credit to the banks we are working with. The Buyer is expected to have good credit rating. On request of the Buyer, we may manage all the project activities related to RFQ/RFP implementation, from inception to successful completion in cooperation with buyer’s and vendor’s management teams. If we do not manage the related project activities, we still monitor performance of vendor(s) against our KPIs to ensure successful completion of the project. They have great capability to ensure that professional multi-disciplinary expertise from local and oversea vendors is delivered, and to provide the buyer with the cost effective technology solutions, in our particular case - for marketing and sales automation. I am very satisfied with timeliness and professional quality of their assistance in implementation of my RFP, designing the digital business model that fits my business needs and its implementation in the manner that keeps my fixed costs low. In our very short E-mail newsletters we provide subscribers with latest news on digital approaches and tools for revenue generation and decreasing cost/expense, new technology trends for increasing employee productivity and best practices emerging as a result of our assistance to buyers of digital assets and services aimed at improving their revenue performance. Please, Sign Up, to be on the edge of technology solutions for revenue performance management in the digital age. You can opt-out any time using Unsubscribe link in the bottom of your E-mail Newsletter. We are using double opt-in mechanism. Please, confirm your subscription from the e-mail message you will receive from us shortly to activate the subscription. IBC Bridge Canada Inc. fuels your revenue with the best technology solutions and reliable local & oversea vendors that have right talents to make your business competitive in the digital age. Abbreviation IBC stands for International Business Cooperation. IBC Digital BridgeTM is registered trademark of IBC Bridge Canada, Inc.
We help your business to build cost-effective digital assets and quantify the benefits of your technology solutions for increasing revenue, decreasing cost/expense and improving employee productivity. 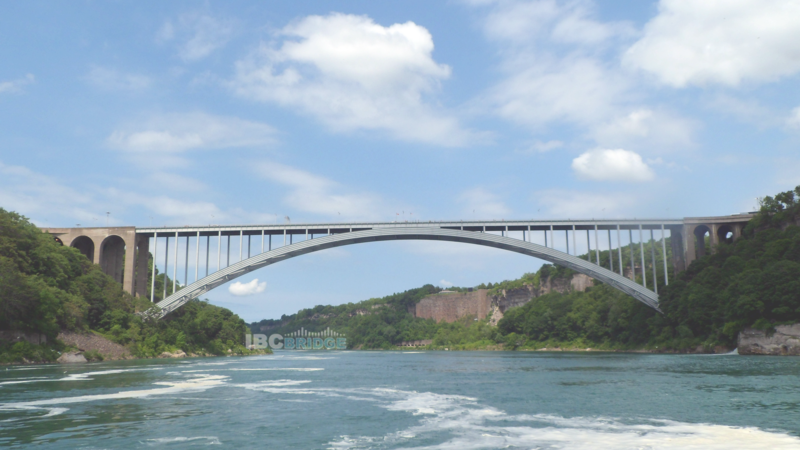 Copyright © 2013-2016 IBC Bridge Canada, Inc.. All Rights Reserved.